Roommate searching can be tough. You have a lot of friends and know a lot of people, but very few that you could actually live with. You need a bigger field to select from if you want to find the roommate of your choice. Not too loud, not too messy, and most importantly not too weird. Well you can take down your Craigslist ad and check out Diggz. This website for finding roommates gets rid of the creeps and matches you with who is truly compatible with you. With their app gaining more and more traction they plan to expand past NYC and solve the roommate crisis for good. Cofounders Rany Burstein and Ben Blodgett tell AlleyWatch about there roommate woes as well as how you can look for roommates on the web or on your phone whenever you want. 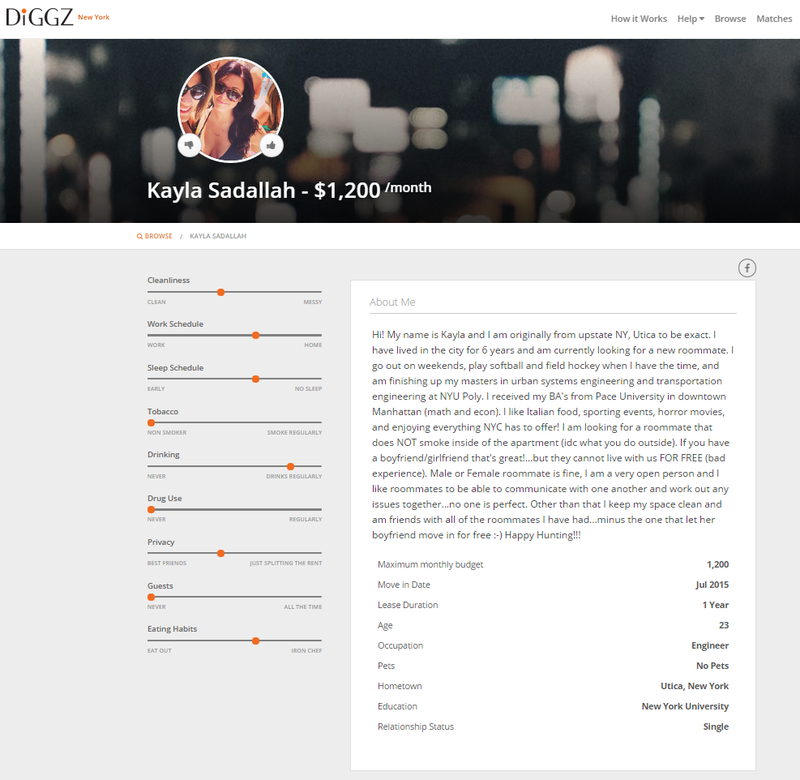 Diggz is an online roommate marketplace that enables users to search and match with prospective roommates based on similar lifestyle attributes, habits and circumstances. A user just needs to tell a bit about himself and our algorithm will spit out personalized and relevant results, making it easier and faster to explore prospective roommates and communicate with them safely on our platform. Users can list their vacant room, find a room to rent, or find another person to apt hunt with. What market does Diggz target and how big is it? There are 35 Million people that move across the US every year; about half of them are in our target market. We are currently focusing solely on NYC but we are definitely planning to expand into other major cities in the near future. Both Ben and myself have lived in NY for many years and have experienced the struggle and pain that is ‘roommate hunting’. I have turned to craigslist quite a few times and couldn’t comprehend that it is the prevailing place to find a roommate… I hated the experience, I hated wasting my time sending emails to people that didn’t want me as a roommate or getting emails from people I would never live with. On top of that, I suffered like many NYers from actually living with a craigslist nightmare of a roommate. In addition, many friends always kept asking me if I know where they can find a roommate or a place to live. Realizing that all I could really suggest is craigslist, I partnered with Ben to create something better, and we started Diggz. Hasn’t roommate matching been tried before? Of course. 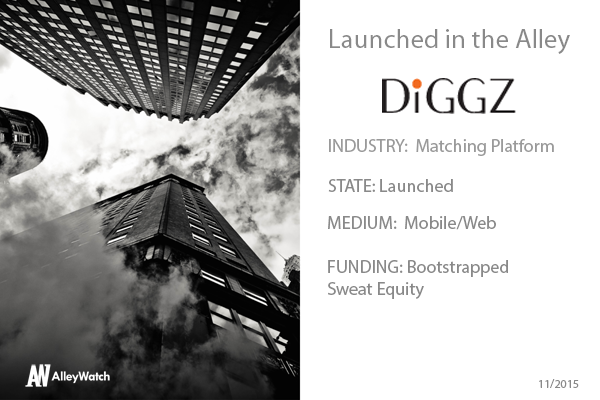 When we started Diggz, there was pretty much Craigslist and some of the older sites (that charge a fee). This space has really heated up in the last 6 month or so, but we don’t think anyone has really made a dent in craigslist’s market share yet. We hope that we will accomplish that. First, we want to further improve the experience for our current users. We have some improvements and new features that we plan to roll out in the next few months. Second, we’d like to better establish our mobile platform. I’m sure there’s so much advice out there that I never got and will probably learn on my own skin, but Avoiding Technical debt is one. I would love to meet Alexis Ohanian since I think Reddit has been one of the most disruptive media projects of our generation, affiliated with YC which I have a lot of respect for and born and raised in NYC. Also would be cool to meet Fred Wilson, who I have Always been an avid reader of his blog AVC and love his ability to cut through the noise to make bold predictions about how technology and the world will interact in the future. It was a no brainer to launch in our own back yard and work to solve a problem that many NYers face. Owning a home in NY is a far dream for most, and rental prices are among the highest in the world. Having a roommate is just part of the culture here and an unavoidable reality for many NYers. This makes NY the perfect laboratory to launch a service like ours. In addition, NY is a great place for tech startups. There is a lot of experienced talent in the area as well as various local investors. Ben: St. Jeromes in the LES, quintessential neighborhood dive bar while I was living downtown, and early kickstarter offices were right above it. Rany: I prefer the later hours of the night… speakeasys like Apotheke and bathtub Gin and in the summer I am a sucker for rooftops.